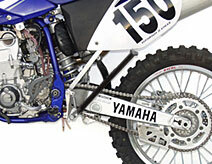 Custom designed kickstands for both Enduro and MX style motorcycles. Strong, lightweight, and attractive. 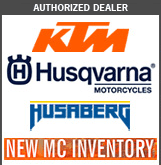 Designed for riders, not showrooms, these kickstands tuck neatly out of the way while riding. 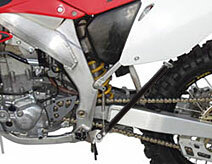 Strong enough to stand on while starting, Trail Tech kickstands feature pivot plates made from heat-treated Chromoly and kickstands made from heat-treated T-7075 aluminum for light weight, strength, and durability. 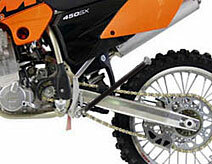 Trail Tech kickstands are guaranteed to hold up to the riders weight. All Trail Tech kickstands are now shipping with black oxide coating. Kickstand Coating: Hard black oxide coating per mil-A-8625 type. Coating hardness of HRC 60-70 gives wear resistance of case hardened steel while maintaining the weight of aluminum. Aluminum reinforced high impact nylon foot at base of stand - no sharp edges! Custom designed for exact model fit - Installs in 10 minutes. No modifications required.